Some thoughts by JOMO of the group Unity & Struggle on Farrel Dobbs' account of the 1934 Minneapolis truckers strike, Teamster Rebellion. 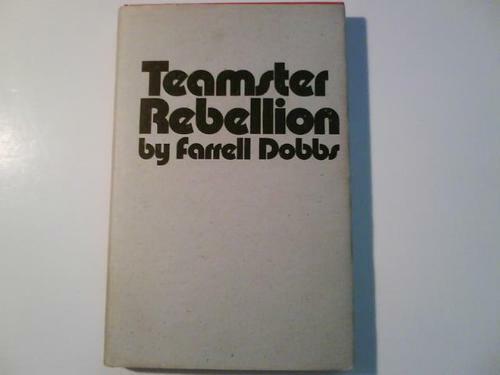 I just read the labor classic, “Teamster Rebellion” by Farrell Dobbs. It is a very exciting book because Dobbs goes into the nitty gritty of organizing 3 major strikes that faced retaliation not only from management, Minneapolis cops, but also from the National Guard. These strikes happened in 1934, a crucial time for the labor movement during the Depression Era. The spirit of resistance and struggle spread like wildfire and in that year alone, 3 major strikes took place in the US — in San Francisco, in Toledo, and in Minneapolis, reminding the world over and over, that the US is a majority working class country. And these workers had a bone to pick with their bosses. There are of course, some problems with learning about organizing through the narratives of grand strikes. One major one is that not all endeavors taken on by the working class are victories. The Minneapolis strike came in 1934, five years after the Great Depression began, arguably after people lived through the worst of their economic ordeals, and after many less successful attempts. The courage of countless workers who stuck their heads out first, their unrelenting resilience that kept them organizing despite the real threat of retaliation are easily forgotten in light of the grand victories. In reality, how people persevered though their losses, continuing to build organizations and infrastructure to keep resisting are often times more realistic for movement builders who have to live through the highs and lows of struggles. Nonetheless, there are many precious lessons to be taken from “Teamster Rebellion.” For one, it brings alive what “class struggle” is. Class struggle, as one finds through the pages of the book, is nothing short of class warfare. There are friends, there are enemies and there is a battle that needs to be won. Today, the euphemism for class oppression is “classism,” and a popular way of addressing it is through richer people recognizing their class privilege. What this translates into is rich people being nice to their poorer brethren. Great, but not quite enough. Reading “Teamster Rebellion,” following Dobbs’s recollection of Bloody Friday in Minneapolis, where workers armed themselves to defend the picket line against police-escorted scabs, reminds one that the way to change the dire economic oppression that workers encounter is through workers coming together, ready to fight and take risks. It is only through these collective actions that workers have a shot at winning. The bosses, capitalists and union bureaucracies don’t give, and even though some are smarter than others in deciding when to cut their losses, its never out of benevolence. Working people have had to FIGHT for their gains, through warfare, wading through tear gas, no less. “Teamster Rebellion” also reminds us that class struggle is not a form of social service. This is important for our times because today, the non-profit industrial complex and its model of treating everyone like a “client” who needs to be taken care of, is overwhelming. These social service models assume that through them, workers should deal with their bread and butter issues with no risk, through the tender kindness and patience of social service workers. This perspective seeps into what people think union bureaucracies should be. Union officials pat themselves on the back that they didn’t organize their workers to get contracts, that everything was done through their cunning negotiations behind closed doors. No. Assuming that everyone needs to be cajoled into abandoning their rage and coaxed into receiving a handout is insulting and degrading. Workers’ struggle for dignity on the job and democratic decision making about the conditions they are willing to accept is part of what it means when we say that the working class need to lead its own liberation. In Dobb’s account, the truck drivers of Local 574 organized to deliberately curtail the power of union officials to negotiate away their demands they wanted to win through their collective action. Instead of a negotiation team, they sent a 2-person committee who did not have decision making power, and whose sole purpose is to report back what the bosses were willing to offer, for the mass assembly of workers to vote on together. The ways that “Teamster Rebellion” describes how the workers pushed the union bureaucracy to the left through their own independent rank and file organizing is insightful. Dobbs recalls the infamous Daniel Tobin, the head of the Teamsters at the time. Tobin engaged in the same rhetoric of red baiting as management, toward the organizers. Also, he presented bureaucratic obstacles to the militancy of the rank and file, trying to prevent them from striking by dumping on them the bylaws and constitution of the union. The truck drivers overcame these obstacles by absorbing the executive board structure, traditionally the power-making body in the Local, into the 100-person strike committee, whom they elected. They incorporated the conservative union leaders into a bigger formation where they would have to treat rank and file like equals. Rather than waiting around for the bureaucracy, the workers took independent action, set up alternative structures and through their power, forced the union leadership to support them. They didnt wait around to go through bureaucratic procedures and red tape. This was crucial for keeping going the momentum of the organizing and instilling in folks a sense of strength and power. I think the fierce stubbornness and sense of power that the picketers exuded despite police repression cannot be separated from this bypassing of bureaucratic red tape. I dont think such a brave army could have been formed if workers didn’t feel like they themselves could control their own fate. From cooks to hospital services, carpenters to auto mechanics, the workers were able to rely on one another’s skills to keep a massive strike going. They had the skills to be self-sufficient. They were the experts! Dobb’s detailed description of how the strike hall was run, its division of labor, its ability to respond to crises rapidly, is a glimpse of how workers solidarity can replace management. How the workers organized to bring in women and unemployed workers into their struggle was also key to their success. The Teamsters involved unemployed workers and included as their demands, the need for more public welfare. They didnt leave unemployed workers out to dry, and they got in exchange, thousands of workers who were not scabs but allies, The Teamsters also organized the Women’s Auxillary, involving the family members of the striking workers in the everyday life of sustaining the strike. They forged community and a powerful fighting force of women who would also go into the streets to demand higher wages and unionization. The struggle was a community’s struggle. In a battle of will between management and the workers, the mobilization and support of a community is power.